Day 2 - Rome with Vatican Dinner. Day 3 - Renaissance Florence and on to Monteriggioni. Accommodation: Borgo San Luigi/Hotel Palazzo San Lorenzo, Monteriggioni, Tuscany. Day 4 - Siena and San Gimignano. 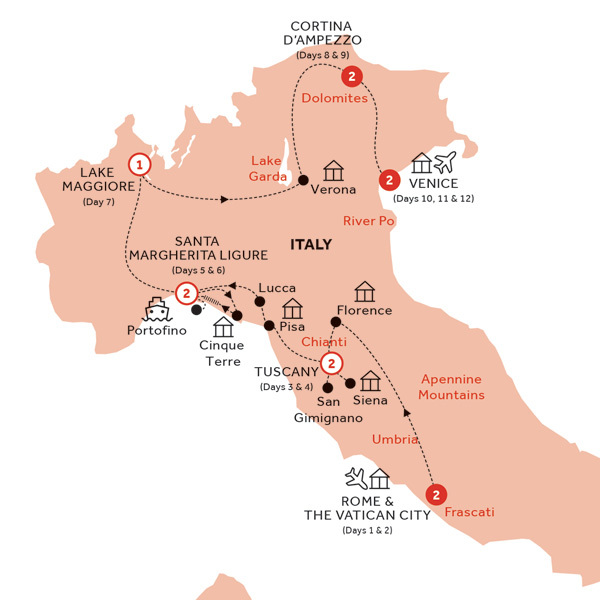 Day 5 - The Chianti Hills to Pisa, Lucca and Santa Margherita. Accommodation: Best Western Regina Elena, Santa Margherita Ligure. Day 6 - The Cinque Terre. Day 7 - Portofino and Lake Maggiore. Day 8 - Verona and Cortina d’Ampezzo. Accommodation: Hotel Ancora, Cortina d’Ampezzo. Day 9 - Experience the Dolomites. Day 10 - Venice, Queen of the Adriatic. Accommodation: Splendid Venice - Starhotels Collezione. Day 12 - Arrivederci Venice.